Located in Downtown Fremont at the corner of Capitol Avenue and State Street at the former Town Fair Shopping Center site (entrance located between 39100 State Street & 39200 State Street). 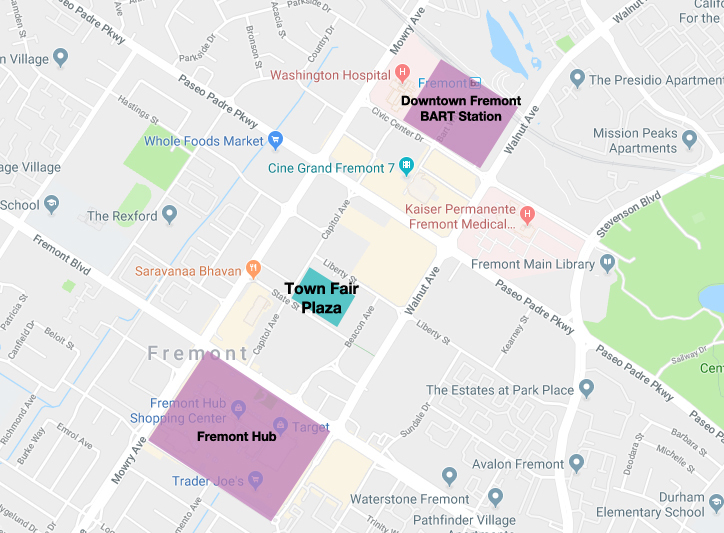 Public Space Authority is partnering with the City of Fremont and Filco Events to envision, build and operate Town Fair Plaza, a temporary community space designed to provide a mixture of activities that appeal to a wide variety of audiences and enliven Downtown Fremont. The Plaza is located along Capitol Avenue, Downtown Fremont’s key corridor connecting the Fremont Hub and Gateway Plaza, and is a short 10-minute walk from the Downtown Fremont BART Station.For more details on all the great improvements taking place downtown, please visit the downtown Fremont website here. Though we hope to pack-the-house with a variety of activities that appeal to all, it is impossible to build every good idea into the project. But, we still need all the good ideas that we can imagine! And we will sprinkle more ideas in as the Plaza evolves. With a focus on community-engagement, PSA seeks input from interested Fremont stakeholders to help influence all stages of design, infrastructure build, and programming. Fair Plaza will influence the future Downtown Community Center and Plaza (Phase 1 of the Civic Center project) planned for this same location. The City acquired the Town Fair sites to house the future Downtown Community Center and Civic Plaza. The Town Fair buildings were removed from the site in the fall of 2017 to allow for a temporary plaza to be activated with innovative and community-based fun! Public Space Authority (PSA) is a private company with a public mission. PSA blends community engagement, research, analysis and intentional design to curate meaningful public spaces that balance community-driven and commercially-driven programming. PSA is managed by influential urban planners who view public spaces as unique living environments with different histories, cultures, and possibilities. PSA embraces a place-making approach to designing and operating public spaces in a way that maximizes value to the surrounding community. We study how a place is used--who uses it, what developments surround it, and who lives or works nearby. PSA also embraces the paradigm that the community is the expert. We utilize a variety of civic engagement tools that leverage feedback. This valued feedback holistically informs our approach to spatial design, infrastructure and the program calendar.